Besançon was the capital of the Sequani; in 58 BC, the town was threatened by the confederated Germanic peoples led by Ariovistus. This prompted Julius Caesar to seize the town, as "requested" by the Gallic peoples. In 68, the Gallo-Roman town, known as Vesontio, rebelled against Emperor Nero and was besieged by Legate Verginius Rufus, Governor of the Province of Germania Superior. Julius Vindex, Legate of the Province of Gallia Lugdunensis, who had raised most Gaul against Nero, attempted to relieve Vesontio, to no avail; defeated by the Germans, he eventually committed suicide. Rufus subsequently turned against Nero, whose successor, Galba, granted several privileges to the town and to the Sequani. Besançon was evangelized in the 3rd century by the semi-legendary Sts. Ferreolus (Ferréol) and Ferrutio (Ferjeux), allegedly martyred on 16 June 211 or 212 (but Besançon also recognizes St. Linus [Lin], the second Pope, as its early bishop). At the end of the 3rd century, Vesontio was erected the capital of the newly formed Province of Maxima Sequanorum. During the decline of the Roman Empire, Besançon was successively seized by the Vandals and the Alemanni, who were eventually expelled by the Burgundians at the end of the 5th century. In the early Middle Ages, Besançon was incorporated in the more or less long-lived Frankish kingdoms that emerged in the region. In the same time, the powers of the local bishops increased and they played a significant role in the dynastic wars among the local rulers; in 811, Bernoin, the first Archbishop of Besançon. was among the six archbishops who certified the testament of Charlemagne, who would die two years later. On 6 June 1302, Rudolph III, the last, powerless King of Burgundy died; Burgundy, Besançon included, was transferred to his nephew, the Holy Roman Emperor Conrad II the Salian. Challenged by another nephew of Rudolph, the Count of Blois and Champagne, Conrad won the War of Burgundian Succession and his rule over Burgundy was eventually confirmed in Solothurn in 1038. The Holy Roman era of Besançon (1032-1654) started under the guidance of Archbishop Hugh of Salins, appointed Archchancellor by Emperor Henri III in 1041 and whose rule over the town was confirmed in 1049 by his close friend, Pope Leo X. Remembered as the "second founder of Besançon", Hugh of Salins significantly increased the town, founded several religious institutions and minted his own coins (estévenant, named for the town's patron, St. Stephen). After Hugh's death in 1101, the St. John and St. Stephen chapters fought the Chapter's War to obtain the control of the town, the quarrel being "arbitrated" by the emperor and the Pope. In 1157, Emperor Frederick Barbarossa conveyed the Besançon Diet. Nothing happened there, except an incident between the Emperor and the Pope's Legate, Cardinal Bandinelle. Two years later, the legate was elected Pope, as Alexander III, against the Emperor's candidate, who claimed the Holy See as Victor IV, causing a 17 years long schism that ended with the Emperor's humiliation by Alexander III. The burghers of Besançon did not enjoy the archbishop's rule and attempted several times, often violence, to set up a free municipality (commune). Besançon was besieged in 1289 by Emperor Rudolf I after the town had taken the party of Otto IV, Count of Burgundy, who had rejected the suzerainty of the emperor. In 1280, Jean de Chalon-Arlay, the emperor's brother-in-law, negotiated the town's surrender; the commune was officially recognized, but placed under the control of the Empire, which did not stop the conflicts with the archbishops. After the death of Duke of Burgundy Charles the Bold and the annexation of Burgundy to France by King Louis XI, Besançon remained loyal to Emperor Frederick III, who married Mary of Burgundy. Threatened by France, the States were relocated from Dole to Besançon. Franche-Comté, Besançon included, was allocated to the dowry of the Dolphin, the future king Charles VIII, by the Treaty of Arras, signed in 1482. Instead of marrying the daughter of Maximilian of Austria and Mary of Burgundy, Charles VIII married Ann of Brittany. Upset, Maximilian invaded Franche-Comté, which he eventually retrieved by the Treaty of Senlis, signed on 23-24 May 1493. After the abdication of Charles V in 1555, Franche-Comté was transferred to his son, Philip II, King of Spain and of the Low Countries, while Besançon remained an Imperial town ruled by Ferdinand I, Charles V's brother. The Besançon Surprise, which took place during the night of 21 June 1575, was the last attempt of conquest of Besançon by the Protestants; after the attempt's failure, the Protestants were banned from the town until the French Revolution. The Diet of Ratisbon, held in 1654, eventually transferred Besançon to the Kingdom of Spain. Besançon did not recognize the Spanish rule. In 1664, the Marquis of Castel-Rodrigo, governor of the Low Countries proposed an agreement, which was never ratified. In 1667, Louis XIV claimed the Low Countries and Franche-Comté as his dowry for his marriage with Maria-Theresa of Austria. Besançon surrendered in February 1668 without fighting to the French troops led by the Grand Condé. Enjoined by the European courts to choose between the Low Counties and Franche-Comté, Louis XIV retroceded Besançon to Spain; the French troops left the town on 9 June 1668. Anti-French plots prompted Louis XIV to invade one again Franche-Comté; after a bloody campaign, the French army, commanded by Louis XIV himself, besieged Besançon on 2 May 1674. The last 800 defenders of the citadel surrendered on 23 May 1674; Louis XIV's victory was celebrated by a Te Deum offered by the Archbishop of Besançon. The French rule over the town was confirmed by the Treaty of Nijmegen, signed on 17 and 18 September 1678. Louis XIV transferred on 22 August 1676 the Parliament of Franche-Comté from Dole to Besançon and ordered Vauban to increase the town's fortifications. On 26 August 1676, he abrogated the commune he had promised to maintain. Besançon was confirmed as the capital of Franche-Comté by Letters Patented signed on 1 October 1677. Intendant Charles-André de Locoré (1720-1784) completely transformed the town, "from brick to marble". The Parliament was suppressed in 1790. Swiss watch-makers established a manufacture in Besançon in 1793. The Watch-making School, created in 1860, was granted a national status in 1891. Once the French capital of watch-making, Besançon declined after the Lip bankrupt (1973-19976). The first factory in the world producing synthetic cloth was founded in 1891 in Prés-de-Vaux by Count de Chardonnet, the inventor of "manmade silk". 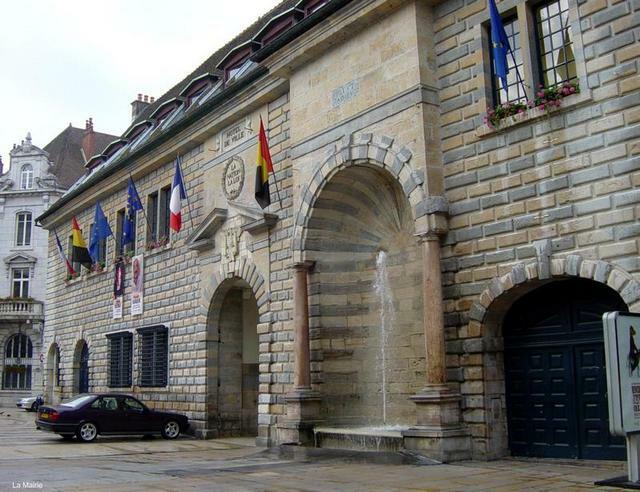 The flag of Besançon is vertically divided red-yellow-black (photo, photo, photo). The colors of the flag, also the colors of the municipal arms, were mentioned for the first time in 1442, when Frederick III (1415-1493), King of the Romans (1440-1486) and Holy Roman Emperor (1452-1493) entered the town. The crowd is reported to have waived yellow, red, and black flags (separately, no tricolor flags were reported!). The first modern flag of Besançon, used for decades, was indeed ... the flag of Belgium. The Municipal Archives of Besançon include an official document dated 17 February 1923, stating that "The flag manufacturer commissioned to produce the [red-yellow-black] flags probably owned a big supply of Belgian flags, whose colours are the same but arranged in a different order; he offered them to the municipal administration of Besan�on, where nobody noticed the mistake." The Municipal Council decided in 1924 that the flag would not be changed until torn out, therefore Besan�on used the Belgian flag for decades..
Another flag appears from time to time in Besançon, a banner of the municipal arms. This flag was sold, probably not exclusively, by the Mouvement Franche-Comté as the "Imperial flag" of Besançon. A similar flag is sometimes hoisted on the Town Hall (photo, May 200), but the eagle here faces the fly instead of the hoist and has a red tongue. The eagle is indeed blazoned as "langued gules" in some sources, but the most reliable sources do not include this detail. The arms of Besançon are "Or an eagle displayed sable holding in its talons two columns gules." Jules Gauthier (Les sceaux et les armoiries des villes et bourgs de Franche-Comté. Bulletin de l'Académie de Besançon, session of 13 July 1882, published in 1883) writes that the oldest known seal of Besançon (1259) pictures the chapter's cross and the blessing arms of St. Stephen, the town's patron saint. 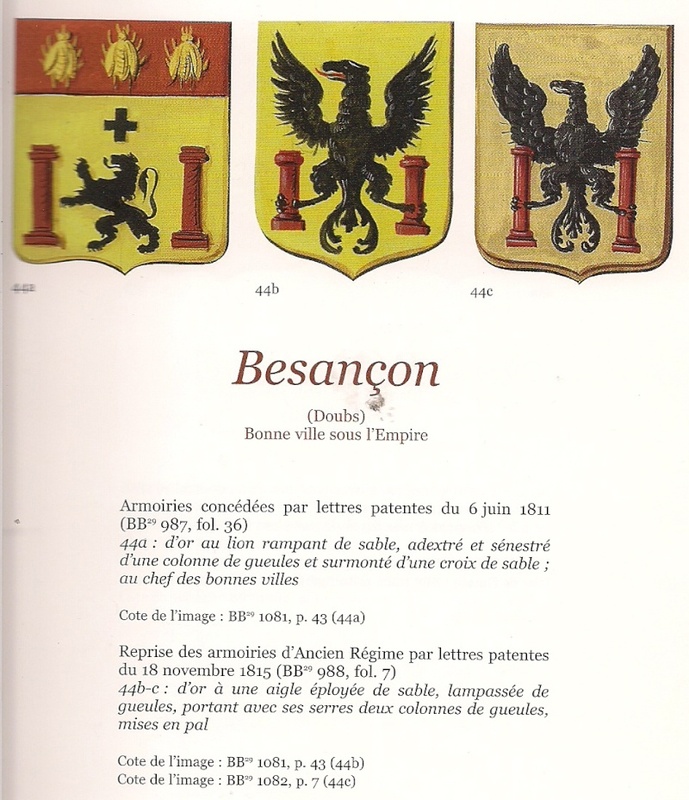 In the 14th century, Besançon became an Imperial town and added the Imperial eagle to its seal. In the 15th century, the town used yellow banners charged with the eagle. Auguste Castan (Un fer à gaufres du quinzième siècle aux armoiries de la ville de Besançon et de ses sept quartiers ou bannières. 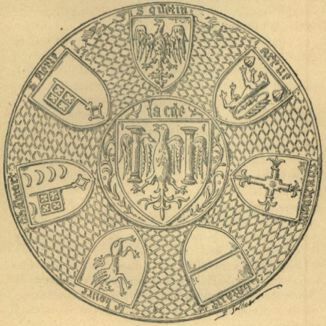 Mémoires de la Société d'Émulation du Doubs, 1884) describes a waffle iron, owned in the 15th century by the pastry cook Girard, decorated with the arms of Besançon and of the seven boroughs of the town. The arms of Besançon (la cité) shown in the middle of the tool, are fairly similar to the modern ones. The eagle recalls the Protectorate established over the town by Rudolf of Habsburg in 1289. The columns come from a Roman temple located in the middle of the citadel of Vesontio*, venerated by the local people as the evidence of a civil government in the early ages. In 1434, the municipal administration ordered a big seal, picturing the eagle gliding over a rock supporting the two columns. On the smaller seal, due to the limited space, the rock was omitted. The heraldic artists of the 16th century, upset by the lack of link between the eagle and the columns, first placed the feet of the columns on the back of the eagle's feet, and then represented the columns held in the eagle's talons. The coat of arms represented on the iron waffle does not include these subsequent modifications, being based on a silver seal inaugurated by the Municipal Council on 7 January 1446. *The main remains of the Roman town were once four columns from a building erected at the top of the acropolis (Hélène Walter & Jean-Claude Barçon. Vesontio Besançon. Presses Universitaires de Lyon). The municipal arms were formally granted to the town in 1537 by Emperor Charles V. Borel d'Hauterive (Histoire des armoiries des villes de France) - a little reliable but very imaginative heraldist - identified the columns as a direct reference to the Pillars of Hercules in Charles V's arms, probably ignoring that the columns were already pictured on municipal seals one century earlier. After the incorporation of Franche-Comté to the Kingdom of France, the arms were "confirmed" - that is, registered in the Armorial Général - in 1698. Suppressed during the French Revolution, the arms were reestablished by Letters Patent dated 6 June 1811, as "Or a lion rampant sable surrounded by two columns gules and surmounted with a cross sable, a chief or three bees or". The eagle, only allowed on the Imperial arms, was replaced by a lion. The chief states that Besançon was one of the Good Towns of the Empire (No. 24), that is the 36 towns whose Mayor attended the Imperial Oath (Decree of the 3 Messidor of the Year XII - 22 June 1804). After the Bourbonic Restoration, Letters Patented dated 18 November 1815 reestablished the original arms (images). The arms of the Archbishopric of Besançon, according to Ferdinand Ludwig Bresler (Les souverains du monde, Vol. 1, The Hague, 1722), are "Gules an eagle displayed or". The shield surmounted with an archbishop's mitre over a sword and a crozier crossed per saltire. The commune of Besançon was divided into seven traditional boroughs, which reached their maximum political significance in the 16th century. The election of the representatives took place every year on 24 June, St. John the Baptist's Day. After the celebration of the Holy Ghost mass in the St. Peter's church, the citizens went back to their respective borough. Four Notables were elected in each borough; in the afternoon, the 28 elected Notables met in the Town Hall, where they elected, among themselves, a President and 14 Governors, who would form the Executive for the next year. The Notables could delay the proclamation of the results of the election, usually for one week, and exert the power during that "interregnum". After the proclamation of the Governors, the Notables assigned two of them to each borough. The President of the Government was changed every week, as opposed to the President of the Notables. The organization of the commune of Besançon might have been reminiscent of the municipal organization of the Gallo-Roman town of Vesontio. A round building, seemingly the place of meeting of the tribe's government, was divided into seven compartments unequal in size. The arms of the boroughs were used as self-standing or embroidered on banners. The citizen who kept the banner at home was called enseigne. Auguste Castan (Un fer à gaufres du quinzième siècle aux armoiries de la ville de Besançon et de ses sept quartiers ou bannières. Mémoires de la Société d'Émulation du Doubs, 1884) describes a waffle iron, owned in the 15th century by the pastry cook Girard, decorated with the arms of Besançon and of the seven boroughs of the town. The arms of the seven boroughs are placed along the border of the iron, surrounding a round medallion charged with the arms of the town. Starting from top, anti-clockwise, the arms are arranged according to the traditional order of precedence of the boroughs: Saint-Quentin, Saint-Pierre, Chamars, Bourg (the four boroughs located within the loop of river Doubs, starting from the highest elevation), Battant, Charmant, and Arènes (the three boroughs located across the river). The description and interpretation of the arms of the boroughs given below is from Auguste Castan. The flag of Saint-Quentin (photo) is yellow with a black eagle. This is a banner of the borough's arms, "Or an eagle sable". in the Middle Ages, these arms, considered as the arms of the Roman Empire, were adopted by the Holy Roman Empire. The borough adopted the arms of the suzerain of the town probably to highlight its precedence over the other boroughs and its connection with the Roman Empire: the triumphal arch known as the Black Gate, then the best preserved monument of Vesontio, was located on the borough's territory. The flag of Saint-Pierre (photo) is red with a white key. This is a banner of the borough's arms, "Gules a key argent in pale". The key is the traditional attribute of St. Peter, the borough's namesake. The flag of Chamars (photo) is vertically divided red-blue, with a white key all over, a yellow crescent at the top of the red stripe and another five yellow crescents placed vertically in the blue stripe. This is a banner of the borough's arms, "Per pale, 1. Gules a key argent in pale surmounted by a crescent or, 2. Azure four crescents or in pale." The key recalls that a part of the borough belonged to the St. Peter parish. The Benedictine monk Berthod (1761) believes that the crescents are distorted representations of the Roman, moon-shaped shield called pelta, recalling that Chamars was once the Campus Martius (French, Champ de Mars), the town's military esplanade. The flag of Bourg (photo) is red with a yellow griffin. This is a banner of the borough's arms, "Gules a griffin or". The borough, also known as Maisel, was the butcheries' boroughs. These shops must be recalled by the griffin, considered as the most carnivorous of the mythical beasts. The flag of Battant (photo) is horizontally divided white-red. This is a banner of the borough's arms, "Per fess argent and gules". The colours of the Austrian suzerains might have been adopted by the populous Battant borough "on a day of official enthusiasm". The cross might recall that the borough was the site of a big sanctuary, used as the parish church by the three boroughs located on the right bank of Doubs. The flag of Arènes (photo) is red with a yellow lion and a white scallop in the upper hoist and fly. This is a banner of the borough's arms "Gules a lion rampant or surrounded in chief by two scallops argent". The borough was named for the ruins of the arena of a Roman theater, to which its main street headed. It was also the site of the St. James Hospital, founded in the 12th century. Accordingly, the lion recalls the wild beast fighting organized in the theater, while the scallops symbolize the pilgrims housed in the hospital.